When Jeri Ellsworth and Rick Johnson were let go from Valve back in February, they didn't want to give up on the top-secret augmented reality project they had worked so hard on during their time as employees. So they obtained permission to carry on with it, formed a company called Technical Illusions, and went to work to create what they would eventually call castAR. Months later, at Maker Faire 2013, they revealed the projected augmented-reality system to the world. Comprising a pair of active shutter glasses, a couple of micro projectors, a camera module and a retroreflective surface studded with infrared LEDs, castAR certainly made an impressive debut. Yet, it was still just an early prototype weighed down by heavy glass elements and solid circuit boards. Today, however, the team is finally ready to reveal the final product in its official Kickstarter launch. Not only is the design much lighter than what we saw in May, but it now has a very intriguing clip-on attachment that can essentially transform the castAR glasses into either true AR glasses that provide augmented reality without the retroreflective surface, or full virtual reality eyewear if you want a completely immersive experience like with the Oculus Rift. This essentially turns castAR into a three-in-one headset, and all in a relatively slim package. As castAR claims on its Kickstarter page, "you will have no need for any other head mounted display." Join us after the break for a rundown of the campaign, some insights from Ellsworth and Johnson and a preview of the device itself. 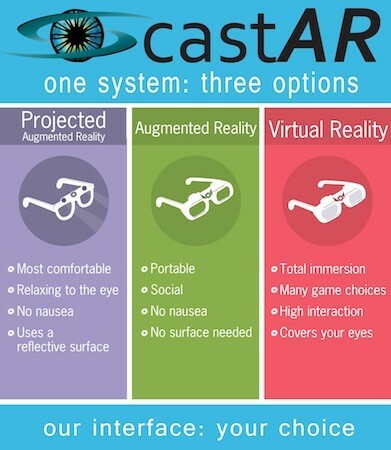 To jog your memory on how castAR's projected augmented reality works, the active shutter glasses are equipped with two tiny LCD projectors that casts stereoscopic 3D images onto a retroreflective surface at a 120Hz refresh rate, that are in turn bounced back to your eyes. There's a small camera module sitting atop the eyewear's bridge that scans for infrared LED markers on the aforementioned surface so that the software can track the position of your head and adjust the images appropriately. The glasses use a HDMI connection to get video, while the camera is connected via USB. Johnson says that communicating with mobile devices is certainly a possibility in the future, but they haven't yet worked out the specifics just yet. Ellsworth informs us that they were able to slim down the final castAR glasses considerably by replacing the solid glass elements on the prototype with lightweight plastic films. The solid circuit board is replaced with thin flex circuits, which should reduce the weight of the overall product to under 100 grams (around a quarter pound). To lower power consumption, the FPGA chip on the prototype will also be replaced by a less power hungry ASIC chip. More importantly to the consumer, all final castAR glasses will have full 720p resolution, which is significantly higher than the one that was demoed at Maker Faire. Those with poor eyesight need not worry either, as they are designed to fit over existing prescription eyewear. However, castAR doesn't just offer the glasses, the clip-ons and the retroreflective surface. There's also a controller called the Magic Wand, which we first saw at the Maker Faire demo. The wand has an infrared marker at its tip, and can be used as either a joystick or a 3D input device. The final version will have buttons, a trigger and a thumb stick for additional controls. As you can see in the demo video below, the wand can be used for striking down virtual objects or moving things around in space. If video games aren't really your thing, then castAR also offers an RFID tracking grid for those of you who love board games. Simply set it underneath the surface, attach special RFID bases to existing miniatures, and with a few tweaks, you can set up your very own virtual Dungeons & Dragons board. Indeed, you can configure the software to display stats and health bars above each character. There's also a special RFID Precision base for those who want two-way communications instead of just RFID tracking. For example, Johnson tells us it's possible to set up a smoke generator and red LEDs around a big dragon type figurine and have it blow "fire" across the characters on the board. This isn't just good for face-to-face gaming either; Johnson envisions that with the internet, you'd be able to play virtual Dungeons & Dragon this way with your friends across the world. Of course, the RFID tracking grid can be used for other purposes too, but virtual D&D is certainly one way to get into a geek's heart. So just what are Ellsworth and co. promising should you pledge to the Kickstarter (and it raises more than its $400K goal)? Well, if you're a developer, you'll get access to the Software Development Kit, Unity integration and several demo games to get your feet wet. Some of them include a real-time strategy war type game, a casual card game, a few physics games that are Jenga-like and a D&D level builder. Ellsworth tells us they're already in talks with several VR game makers, so it appears that existing VR games can be easily configured to work with castAR as well. "Our tracking system API will hook up to Oculus-style games very easily, but developers will have to do a little work to make it happen -- for example, it takes about five minutes to put head tracking into a game built in the Unity game engine." Ellsworth wanted us to know that the making of the Kickstarter video itself was a journey. "One of the things we're very proud about is that every visual of gameplay was done with our hardware. There's no CG or other kinds of trickery happening." She told us that they mounted the projector on the glasses as close as they could to the camera lens, and that the camera operator was "a little grumpy" with them because he couldn't see the projections as he was filming. "This whole project has been driven by just Jeri and myself," said Johnson. "We worked every day of this year, five to six days, 14 to 16 hour days. Our resources between the two of us are stretched thin." However, the two believe they have something special, and that the future is bright for the technology. "It was such a magical project [at Valve]," said Ellsworth. "We just couldn't let it die. It's so magical. There's nothing out there like this." If you want to learn more about castAR, have a peek at the demo video above or hit the source to see if it's worth pledging.